Ponds are a great garden centerpiece--that is, when they are running smoothly with clear water, healthy plants and fish. Oil spills do not happen often. When they do, they can wreak havoc on the miniature ecosystem in your pond. Oil spills can occur when a submersible sump pump not designed for ponds starts to leak. Submersible pond pumps contain mineral oil which is safe even if it leaks into the water. Cleanup is easy to perform and quick to accomplish. Spread newspaper all around the perimeter of your pond. This will absorb the oil. Place the pond hose tip at least 6 inches under your pond water level. This will lessen the water surface disturbance that will occur when you turn the water on. Add dechlorinator if you have fish. Measure enough to treat the water that you will be adding to your pond. Turn the water on at a low rate of flow. You want your water level to rise slowly so it doesn't disturb the oil. Turn off the water when you see that all the oil has flooded over the pond. The newspaper you placed in the first step should now contain all the oil. 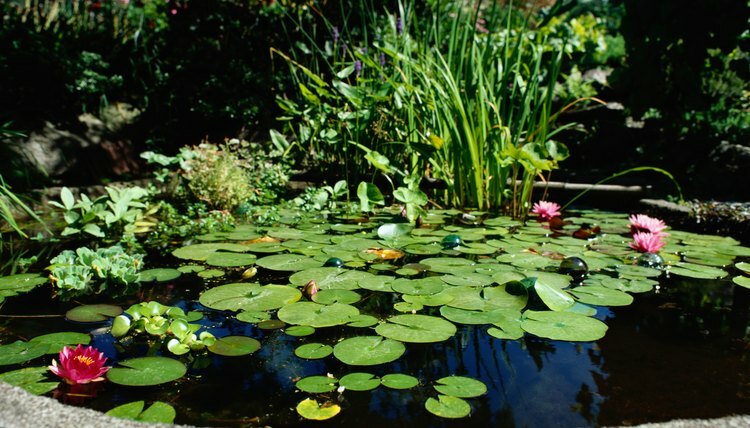 Drain your pond to your desired water level. You can drain it through a bottom drain or discharge using your submersible pump. Discard the newspaper. Your garden hose will suffice if you do not have a hose dedicated to your pond. Before placing the tip in the pond, run water through it for two minutes to clear out any unwanted debris. If the oil spill is caused by your submersible pump, do not use it to drain your pond. You will need to find an alternate way of draining. Wear gloves. You do not want to get the oil on your own hands.